It's not that the dress form is a required tool for all sewing, but for this project, and my process, having one will shave hours - probably days - off the time it takes to create. That, and a dress form is a uniquely suitable place to store a wedding dress safely, leading up to its debut. At home, my dress form (Lucille, an adjustable form originally purchased and used by my great grandmother) was responsible for the creation of three prom dresses before I had any drafting skills at all, along with countless draped projects with varying degrees of success. It's hard to ship a mannequin halfway across the world though, so now I've got Pearl. When I received her, the adjustable part of her pole was seized with rust - nothing a little elbow grease and a lot of WD-40 couldn't fix! Pearl is another adjustable dress form, this time made of fiberglass with a knit fabric cover. In most cases, if you're looking, it's best to get a non-adjustable dress form just a bit smaller than your measurements, but I'm so small that non-adjustable forms are nearly all my size or larger, whereas most standard adjustable forms will size down well enough to work. Especially the vintage ones. But - for draping a close-fitting dress, Pearl's not going to work for me unless she's shaped exactly like me, and in her original form she's really, really not. Shaping can be done with batting, fabric scraps, or anything with a bit of depth so that you can sculpt curves where curves are necessary. My parents gave me a set of Fabulous Fit foam pads for Christmas years and years ago, so I'm using those as a jumping off point. There's a lot of information available on padding out a dress form online ( this article is good but the dried bean idea is weird, this is very thorough, this one is A+ if you're into lists, the list goes on. If you're going to pad an existing form, one might say there are a lot of ways to do it, but the principal is always gonna be pretty much the same). 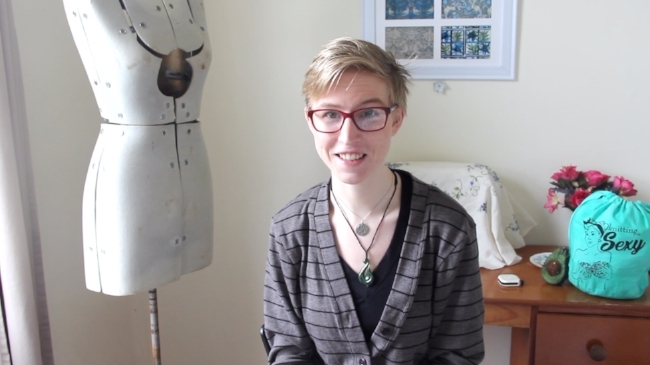 I don't think having another voice is ever a bad thing though, so this week's Wedding Dress progress video is all about my variation of the process of padding out my dress form in preparation for draping! The Fabulous Fit system (the foam pads and covers I used in my video) is available here. The nice thing about having Pearl all sized and ready to go is that it's a solid jumping off point for quite a few steps in this process. Now that Pearl's ready, I can drape my pattern, mock it up, fit it, and create pattern pieces. Once that's done, I'll work on my complete mockup while simultaneously using the pattern pieces to design and begin the bodice beading (after I build my slate frame, of course). When my hands need a break from the beads, I can switch back and drape the bodice for the reception dress.... goodness it seems like a lot of work when it's all in sentences like this, doesn't it? !